Windgo, Inc. is a pre-revenue emerging technology company focused on research and development of layered automation devices, smart materials, and integrated subsystem solutions designed to serve the future market needs for the Internet of Things(IoT) communications revolution. This market expansion is forecasted for the 2022-2025 timeframe to yield significant growth opportunity to sensing, automation, data analytics and control deployment. Windgo is in the process of developing a portfolio of intellectual property(IP) that is strategically diversified and intended to serve a broad range of markets including: smart windows, communication bridges, smart building materials, automotive sensors, security modules, and intelligent product subsystems. The short-term areas of development are primarily focused in sensory, vibrational resonance, and digital signage markets with layers of nano-smart materials and vibrational transfer technologies. In contrast to chasing the latest trends and fads in technology development, Windgo focuses on the subsystem infrastructure and platforms for smart material sensing and communication. Windgo’s IP portfolio of patents, algorithms, and trade secrets are building a composite solution set of protected ideas that will be productized and commercialized into demand-pull market segments. The overall goal is to evolve products that are “smart” because the materials they are made of have the ability to harvest their own energy, sense their surroundings and communicate through networks of IoT globally. 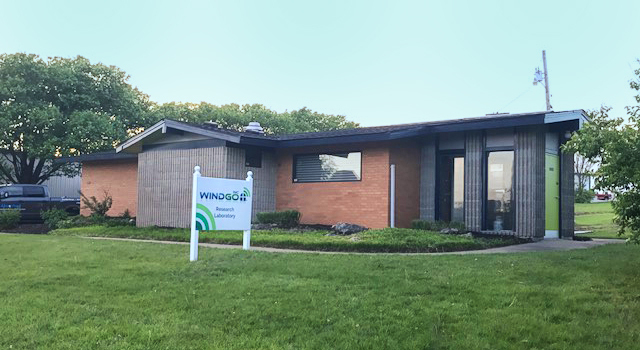 Beyond present day technology that relies on sensing devices being attached through circuit boards to the products or somehow connected to the product, the future smart materials will become “smart” with Windgo, Inc. licensed technology. Alongside the research and development efforts, Windgo is actively scouting and vetting business opportunities with established companies in the markets to yield strategic partnering in profitable and creative ways to increase the capabilities of their existing and future products using Windgo, Inc. technologies and advancements. Windgo believes that these relationships will lead to large scale licensing, subcontracting and high-volume sales opportunities. Unlike many other earlier stage companies with a singular narrow focus, Windgo, Inc, and its intellectual holding company Newtonoid Technologies’ already broad and growing IP portfolio offers partners and shareholders a more diversified investment opportunity with a truly innovative team addressing the future of cutting-edge smart material science.